The new update 121 of java 8 has released by Oracle. Users can upgrade their java version to latest one. There are quite a few security and performance enhancements in Update 121. Check all changes and features of this release in this article and Offline Installer links are also given in the article. As Java on your machine is installed and there comes update for its new version time to time. You can check manually that is there any update available or not. Go to Control panel and type Java in search box and then open the result it gives. Now go to “Update” bar and click on “Update Now”. 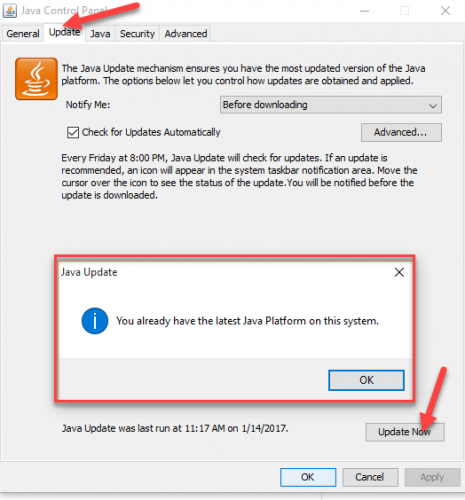 If your Java version is already updated, it will give you pop up message that your version is updated. Otherwise you can download it from the links below. If you don’t have Java installed, you can use the following direct download links to the offline installers of Java 8 update 121 (latest at this time of writing). The compelling features of Java 8 update 121 is expounded here. Just have glint look on them. In this release, the majority of security issues are fixed. The Oracle highly recommend its users to upgrade to this release. Advanced Management Console is added for administrators for java running desktops in enterprise that enables more secure environment and advanced application experiment. The safe validation mode of XML restricts the RSA and DSA keys less than 104, because they are no longer secure for digital signatures. Now more checks added to DER encoding parsing code to catch the encoding errors. And the signatures which are having very long length encoding, IOEXception will be thrown for that. A new property “java.util.logging.FileHAndler.maxLocks” is added. This defined the logging configuration file and make it possible to configure the maximum number of simultaneous log file. The expiration date for the java 8u121 is 18 April 2017. The new update will available as developers develop something more advance and more secure than this 8u121 release. Update your Java version and enjoy the more secure and safe environment for your applications. It is recommended by Oracle to upgrade your Java version and your System become more smooth than before.